From the Cumberland Gap to the Atlantic Ocean, this is Virginia Water Radio for the week of December 23, 2013. This week, we look back on 2013 with a medley of mystery sounds. Have a listen for about 70 seconds, and see if you can identify these sounds from the past year of Virginia Water Radio. If you guessed all these, you’re a genius! The sounds were pebbles on pond ice; the Virginia Senate committee on Agriculture, Conservation and Natural Resources; a weather-balloon launch; a Chesapeake Bay Dial-a-Buoy recording; children observing Kids to Parks Day; a Virginia Rail; an electrofishing demonstration; a Yellow-billed Cuckoo, also called a “rain crow”; a thunderstorm along the New River Trail; a member of the Virginia Tech team researching the large salamanders known as Hellbenders; a skit on photosynthesis; and finally a tea kettle, representing the water-cycle process of evaporation. I hope that your upcoming year is full of water-related sounds and many good things. Thanks to the Lang Elliott for permission to use the Virginia Rail sound, and to several friends and colleagues for lending their voices to various episodes. 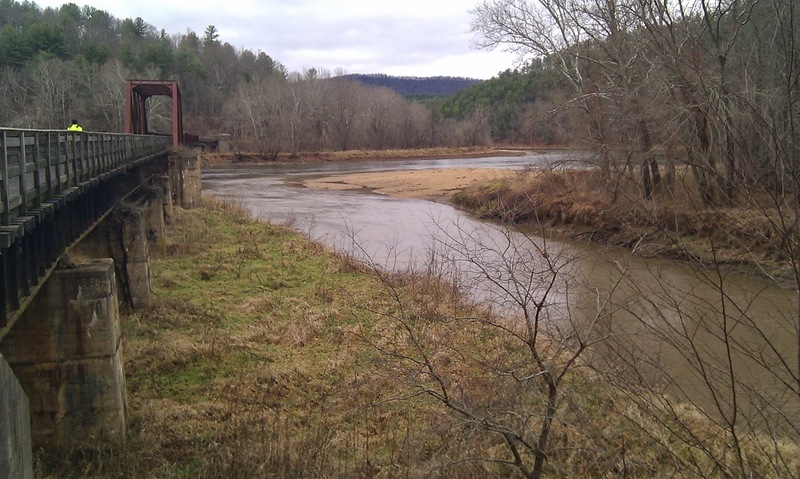 Confluence of Chestnut Creek with the New River in Carroll County, Va., December 7, 2013. Acknowledgments: The sounds of the Virginia Rail was taken from the Stokes Field Guide to Bird Songs-Eastern Region CD set, by Lang Elliott with Donald and Lillian Stokes (Time Warner Audio Books, copyright 1997), used with permission of Lang Elliott, whose work is available online at http://www.langelliott.com/ and the “Music of Nature” Web site, http://www.musicofnature.org/. Water Cycle – Episode 191, 12-9-13. For the 2012 Virginia Water Radio “Year of Sounds” episode, please see Episode 141, week of 12-17-12.